Followers of this thread will remember the English/Emigre forces' defeat outside St Nazaire and their subsequent rather hasty retreat. The remains of the army have pulled back towards their base at Pornichet, pursued, albeit not too closely, by the victorious Republican forces. The decision has been made to embark the army and retreat. The expedition is over and all that now remains is to get as many troops away safely. It is now vital that the rearguard can gain time for the embarkation of troops, horses, stores and loot, oh and Royalist refugees if there's room. The Republicans chose (as a result of some throwing of dice) to isolate the garrison of Pouilliguen to the West and attack the main Allied base of Pornichet. Major General Ambercrumble has taken command of the rearguard, a force slightly reinforced since the debacle at St Nazaire, but several units have not yet fully recovered. Ambercrumble elected to delay the Republicans a few miles outside Pornichet to the East where the main road crosses several small rivers and streams. The battlefield from the NE showing the Allied dispositions. 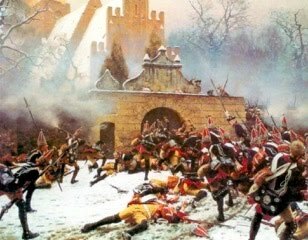 Ambercrumble put his weakest troops in the first line, supported by the cavalry and the Brigade of Guards can be seen way back near the church. Pornichet is about where the patio table can be seen through the French Windows. John again took the French. I will let the photos help unfold the story of the battle. The Highland brigade under Colonel Weasley. Both battalions were still recovering from breaking in the previous battle so would have a minus 1 on their saves, saving on 5+. The Allied cavalry. Three units of Emigres on this side of the stream, with the 15th LD on the other. Royal Artificers attempting to demolish the bridge, supported by the 'flank' battalion. The Royal Emigrants on the left holding a ditch line with the previously battered Mirabeau Legion marching up the road on their right. The French were slow to deploy as the very first throw of the dice was a blunder! Nonetheless the horse artillery were quickly in action, and soon had silenced the Allied cannon to their front. The French advanced on a broad front, although the focus of their first attack was to be the bridge on their left. 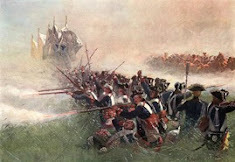 The French storm over the bridge, forcing the Sale-Kirkberg skirmishers to pull back. 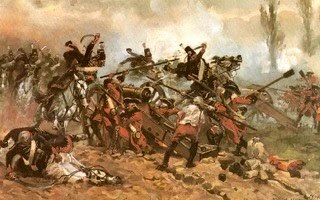 The horse artillery turned their attention to the next section of Royal Artillery and forced them from their guns. The Republican columns can be seen massing in the distance. The Uhlan Britaniques and the Choisil Hussars supporting the first line of defence. Not much call for cavalry unless the enemy were to break through. The first Republican demi-brigade is across the river on the extreme left of the Allied line. The battle for the right-hand bridge. Republican grenadiers chargé over the bridge and I went two whole turns without hitting a single enemy with my cannon or musket fire! Then to cap it all the 79th Highlanders who were lining the riverbank to the right of the bridge failed a break test and routed! Happily the 92nd were in a good position to hold the Republicans back for the moment at least. The 2nd Carabiniers crossed the river. They were followed by the 8th Cavalry. The 79th top left, jut before they legged it! They were closely followed by the gunners manning the artillery section seen here. The Allied left was in danger of being destroyed. 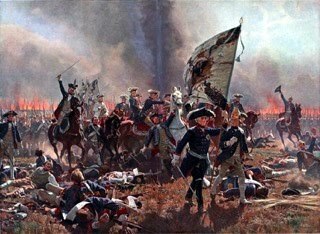 Both cannon had been silenced, the 79th had run and the 92nd were soon shaken and forced to retreat. Colonel Weasley was seriously wounded and the Republican divisional commander was killed. 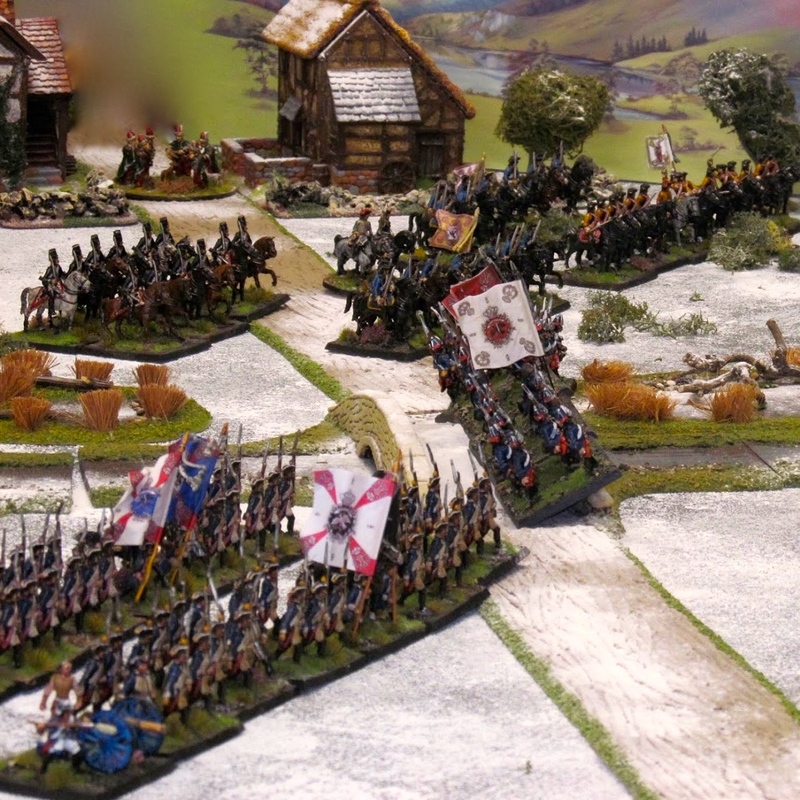 I had no option other than to bring my Emigre hussars forward and managed to force the enemy into square, gaining a bit of breathing space. The troops in the first line were under extreme pressure. The Mirabeau Legion in the distance had been forced into square by the Republican carabiniers and the Sale-Kirkberg light infantry had withdrawn to safety. The Royal Emigrants (centre) were now facing upwards of three battalions of enemy. The Rohan light infantry were garrisoning the building on the riverbank and were shaken, as were the Perigord light infantry (with the red crests). I moved the Damas Legion forward from the buildings they'd been occupying to shore up the line. The Guards had moved up and were now in the process of forming a second line behind the Emigres. The sole reserve left to me was the 'Flankers' battalion. Ordering them forward, they promptly blundered backwards! John pushed the 23rd Cavalry (the pinko Parisien Ladyboys) over the river, forcing the Perigord regiment to evade. On the left I pulled my hussars back from the Republican squares. The 92nd were slowly retreating in the face of the enemy advance across the bridge. In another bold move John launched the 8th Cavalry in a charge to pin the Royal Emigrants, which they did admirably, forcing them into square. I tried to be clever and pushed the Damas Legion up into close range of the enemy horsemen, but failed to score single hit! Their job silencing the Allied cannon done, the Republican horse artillery limbered up and crossed the river in a bold 'follow me' order. Back in the maelstrom of the right flank the Damas Legion were forced to form square by the enemy cavalry but were then charged by a battalion of Republican Legere. Predictably the Emigres turned and fled. The Emigre brigade was now spent and all units that could were forced to start withdrawing. Not before forcing the 2nd Carabiniers to retreat shaken. Sometime around this point the Mirabeau Legion finally crumbled under the pressure of fighting off repeated attacks from the Republican infantry and broke to the rear. The 15th LD then charged the 23rd Cavalry and beat them back over the river shaken. This resulted in the entire Republican cavalry brigade becoming spent as the majority of units were shaken. Sweet revenge for the 15th LD for their defeat by the very same regiment outside St Nazaire. Not wishing to throw my cavalry away I declined the opportunity to do a sweeping advance and pulled back. Their lust for revenge satisfied, the victorious15th LD about face and pull back from their rather exposed position. Thirteen battalions of Republicans are now swarming over the river and there's not much in their way, just the cavalry, the Guards brigade and the tenants of the Emigres. The three Guards battalions start to withdraw back over the river. I pushed the Uhlans Britaniques along the road to threaten and hopefully delay the Republican infantry. By now their cavalry was no longer a threat as all three units were shaken. The Uhlans Britaniques covering the withdrawal of the Sale-Kirkberg Light Infantry. My favourite Emigre regiment is the Royal Emigrants. Here they are pulling back while in square. Thankfully the Republican cavalry close by to their right were spent and would be no further threat. Those bloody Republican cannon. While the rule amendments made artillery less of a killing machine they remain dangerous when grouped together in a battery. So there you have it. The Republicans had won a tactical victory but the English/Emigre forces had snatched a strategic victory by delaying the Republican advance long enough to carry on with embarkation plans uninterrupted, for the time being at least. The cost had been high for the English and Emigres. Colonel Arthur Weasley in command of the Highland Brigade had been seriously wounded. Eight cannon (including battalion pieces with the Damas Legion) had been lost to the enemy and the Rohan Light Infantry were unable to retreat and surrendered themselves to the tender mercies of the Republicans. The Guards were untouched, and the cavalry were still an effective force so a close pursuit by the Republicans was not likely given their lack of usable cavalry. Of the Emigre infantry, only the Royal Emigrants and Salm-Kirkberg Light Infantry were capable of fighting on. Worse still the 79th Foot had broken AGAIN! Any further combat would see them saving on 6+! Republican losses were negligible but many battalions were in no fit state to continue the fight and the cavalry brigade had been broken. 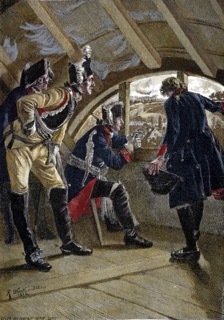 Both divisional commanders were casualties; Lafonde de Patrie (brother of the Lafonde de Patrie killed outside St Nazaire) mortally and General Trecon was killed outright urging his men on from the rear as they crossed a shot-swept bridge! The expedition clearly has so far been a complete failure. During the early evening Ambercrumble's command retreats to the inner defences of Pornichet (little more than a few earthworks) while the remaining English troops wait to embark. There are also a handful of Emigre units but they will take second place to the English when it comes to escaping, as well as a growing number of Chouan rebels eager to escape a certain death at the hands of the Republic. And, there still remains the garrison at the other end of the bay at Pouilliguen in need of evacuation, which includes four battalions of English foot, a troop or two of light dragoons and a large number of Emigre troops and Chouan. I can sense one more final game if the dice rolls dictate that the Republic will renew their attacks on both towns in order to interrupt the evacuation. A great game. We both enjoyed it, and it was another toughie, as my troops were spread very thinly and generally pretty poor due to their defeat outside St Nazaire, and the Republicans were largely ill-trained conscripts. The Emigre/Scots 'speed bump' did its job in holding the Republican attack back but at the cost of heavy casualties. The Guards probably could have held their own supported by the cavalry but that wasn't in the script. I'm off the the Durham Wargames Group show on Saturday, and the following Saturday it is a big game, the Battle of Kolin. Thankyou for another cracking game and a wonderful campaign, which I have followed with immense pleasure. A great looking game with wonderful figures and scenery - this is a really colourful era with an amazing range of uniform styles and colours! What a beautiful looking game...and I'm jealous, this wooden bridge is a masterpiece!